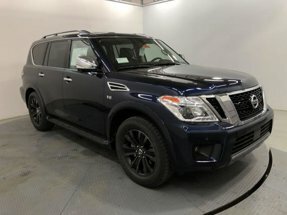 Description Sunroof, Heated Leather Seats, DVD, NAV, 3rd Row Seat, [X01] CAPTAIN'S CHAIRS PACKAGE, Tow Hitch, Alloy Wheels, All Wheel Drive, Quad Seats. SUPER BLACK exterior and Almond interior, Platinum trim. Warranty 5 yrs/60k Miles - Drivetrain Warranty; CLICK ME! Leather Seats, Third Row Seat, Navigation, DVD, Power Liftgate, Rear Air, Heated Driver Seat, Heated Rear Seat, Cooled Driver Seat, Back-Up Camera, Running Boards, Premium Sound System, Satellite Radio, iPod/MP3 Input, Trailer Hitch Rear Spoiler, MP3 Player, Sunroof, All Wheel Drive, Onboard Communications System.